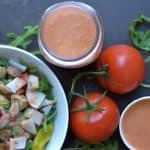 This Smoked Tomato Vinaigrette comes together with just a few ingredients and in only a few minutes! It’s a perfect addition to any salad or veggies. 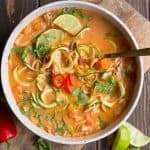 I would just like to say, it’s about dang time this recipe finally got it’s own post. 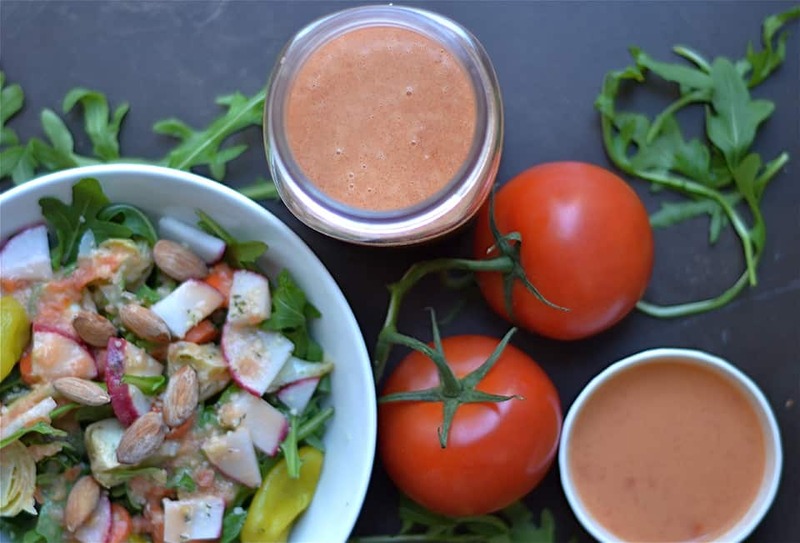 This is one dressing I keep on hand ALOT, because it’s super easy and versatile. I eat salad everyday for lunch, and we also serve it every night with dinner. I never buy dressing at the store. Not because I don’t think it’s convenient (it is), but honestly, because I don’t like any of it. I find home made dressing to be sooooooooo good, which is the main reason why I eat salad so much. I LOVE IT!!!! 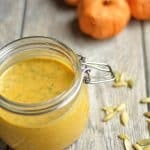 It’s also super easy to make, and all of my dressings take less than 5 minutes to make. Including this one. 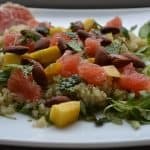 Salad is one of these foods that can get boring really fast if you don’t change things up. I can tell you that I have happily eaten salad everyday for years (I can’t really think of many days I skipped it), and I can never get tired of it. Mainly because I always switch it up, change my dressings or the “theme” of the salad. 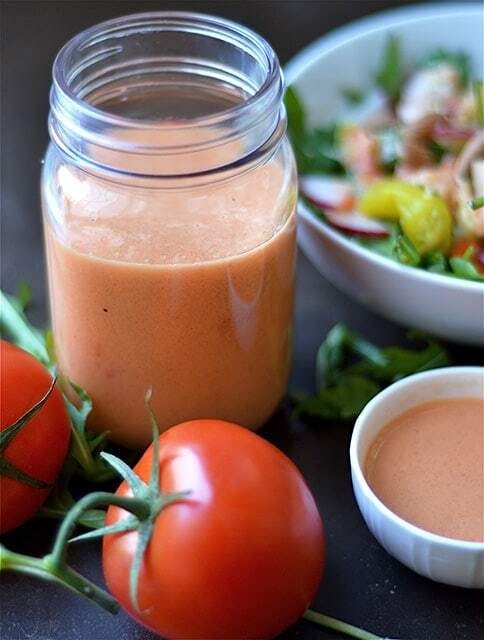 This easy Smoked Tomato Vinaigrette is one that can stay fresh in the fridge for a few weeks, and can go on ANYTHING!! 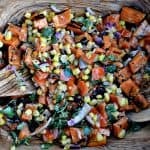 I actually have it as a dressing to my popular Grilled Sweet Potato Salad. 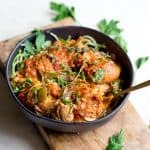 A fun summer side dish that is fantastic to serve to guests, but also a great dish to bring to a potluck. 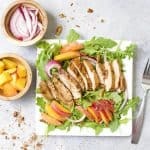 Recently, a friend of mine was asking for fun ideas for salad toppings since she is trying to eat salad everyday for lunch. Such a better and uplifting topic than many of the things I have seen on FB lately……….. Just putting that out there. Anyhow, I gave her a list of some of my favorites besides the traditional tomato, cucumber, onion. I absolutely love different textures. Crunchy beets, marinated artichoke hearts, pepperoncicnis (like up there with my top 5 foods I can’t live without), avocado, radishes, hemp hearts, almonds, pistachios, shaved brussel sprouts, bell pepper, chickpeas, fresh herbs like cilantro/basil/mint are a few of my favorite salad toppings. The greens are usually always arugula (top 5 food I cannot live without), but I also add in at least another green to mix up my nutrients. So who wants to join in on a salad challenge? Challenge yourself to eat at least 1 salad for the rest of year? 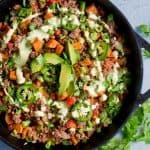 A fun way to make sure you add in a bit of greens, but also give your ways to be creative and find new ideas! Begin by placing tomato, vinegar, garlic, and liquid smoke into a high powered blender or food processor. Blend for about 30 seconds to 1 minute, or until dressing begins to get smooth. While motor is running, slowly pour in oil. Sprinkle in salt and pepper. Continue to blend until no chunks of tomato remain. Taste and adjust to add more salt or pepper (if needed). Serve over a bed of greens, or grilled vegetables. *Liquid smoke can be found in the condiment aisle near the BBQ sauce in most grocery stores. Be sure to check for ingredients, as some brands have a caramel coloring that is not necessary.